Three young people, elected by the General Assembly, representing the three regions and members of the SDB and FMA Youth Ministry departments. Each year one of the young representatives coordinates the Small Team. Every elected member of the Small Team is in charge for three years, with no possibility to be re-elected. The main criterion to keep in mind for the choice is to make it possible that every European region is represented. Young taking part to the General Assembly will be grouped in regions according to their geographical country of origin. Every group will elect its own representative and a second one. North: Germany, Austria, Great Britain, Ireland, North Belgium and Holland, Malta. Central: Czech Republic, Croatia, Belarus, Ukraine, Russia, Lithuania, Poland, Slovakia, Slovenia, Hungary. South: Italy, Switzerland, Albany, France, South Belgium, Portugal, Spain, the Middle East, Romania, Moldavia, Kosovo. The meeting of the Small Team takes place in presence at least once a year. Contacts will be held using the net. 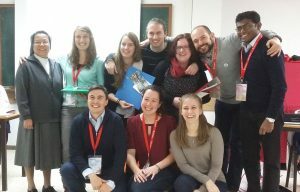 To organize the General Assemblies of the European and the Middle East Salesian Youth Movement. Time to know the status of the Movement in the different countries; time to exchange and share. Meeting with young involved in other movements (other congregations, other religions). 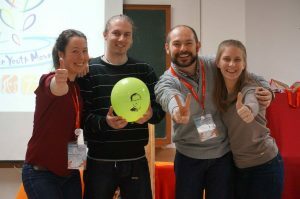 To share ideas to help the Small Team to organize the European Confronto. Evaluate the work of the Small Team. To coordinate the organization of the European Confronto. To maintain and update the ways of communicating of the coordination as the main contact tool. To coordinate other common moments at European level.